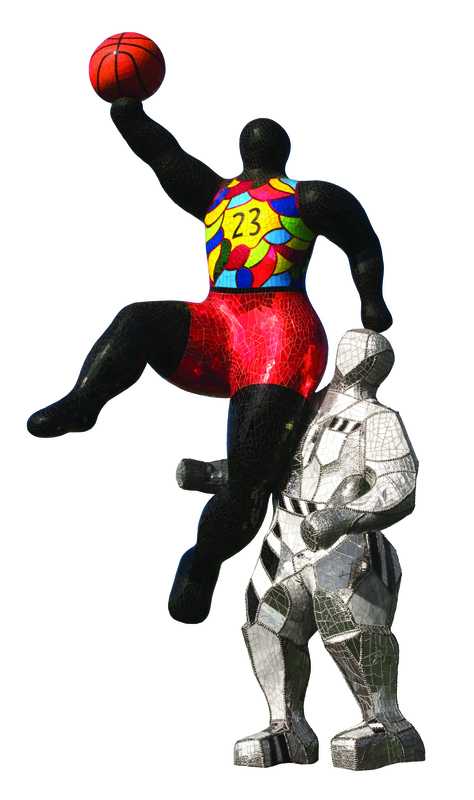 Complete in 2000, Nike de Saint Phalle’s Black Heroes series was truly important to the family and life of the artist. Her work aims to bring joy to and inspire viewers, and this endeavor was no exception. As a child, Saint Phalle searched for heroes and cultural icons to look up to and wanted to instill the same ideas into her biracial great-grandson. Saint Phalle chose prominent and inspiring members of the African American community related to sports or music to highlight in the Black Heroes series, such as jazz musicians Miles Davis and Louis Armstrong, performer Josephine Baker, and athletes Michael Jordan, Tiger Woods, and Tony Gwynn. #23 Basketball Player was created in 1999 and is intended to represent the incomparable skills of the NBA’s most famous athlete, Michael Jordan. 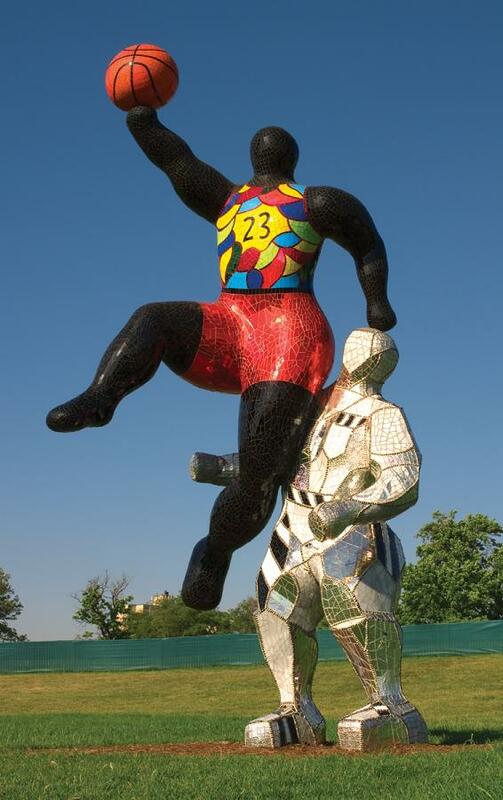 The positioning of the sculpture directly references the infamous “slam dunk,” the defining maneuver of his career. The silver sculpture underneath the basketball player is a spirit that lifts him to unimaginable heights. #23 Basketball Player will be featured as one of the four sculptures featured in the New York Avenue Sculpture Project, on view April 28. Ali Printz is an intern at the National Museum of Women in the Arts. This entry was posted in Artist Spotlight, New York Avenue Sculpture Project by Women in the arts. Bookmark the permalink. thank you for sharing this. I’ve just recently become a fan of her work. I love her use of color and size and texture. It is playful and fun while at the same time her works focus on some serious subjects. Very inspirational works. I love her Nana series as well. Awesome! Keep talking about her! She is my newest hero.